Praised for its ability to attack and eliminate embarrassing breath odor, the patented TheraBreath formula in Fresh Breath Oral Rinse uses the power of oxygen to target bad-breath-causing bacteria deep below the surface of the tongue and at the back of the throat. This refreshing, alcohol-free rinse doesn't burn or sting, so it’s easy to use every day. TheraBreath Mild Mint Oral Rinse is certified kosher, gluten-free and vegan. It is also free of dyes, perfumes, detergents, and other harsh additives that can dry or damage the mouth. TheraBreath Fresh Breath Oral Rinse is our flagship product and has been dentist- and pharmacist-recommended for more than 20 years. TheraBreath Fresh Breath Oral Rinse is an ADA approved product and has become one of the United States' best-selling speciality oral hygiene treatments. Fresh Breath Oral Rinse by Dr. Katz attacks sulfur-producing bacteria, morning breath, and food odor. In fact, clinical studies have verified that TheraBreath is extremely effective at attacking bad breath odor for up to 24 hours. This powerful mouthwash eliminates even the most severe cases of bad breath or halitosis (which is the scientific name for this condition). Dr. Katz’s proven oral rinse formula does not contain alcohol, artificial flavors, or colors. It is also pH-balanced to maintain a non-acidic environment in the mouth, which reduces burning and enamel erosion, while preventing tooth sensitivity. This product is safe to use twice daily and is available without a prescription. This product is sold as a pack of two 16-ounce bottles and is available in a Mild Mint flavor that is easy on sensitive teeth and gums. As with all our products, TheraBreath Fresh Breath Oral Rinse is guaranteed to work to your satisfaction, or your money back! Health Facts: Ethyl alcohol-free, aluminum-free, no fragrance added, dye-free, gluten-free, non-toxic, paraben-free, Sulfate-free, artificial color-free, artificial flavor-free, vegan, phthalate-free, fluoride-free, artificial fragrance-free, formaldehyde-free, propylparaben-free, butylparaben-free, nonylphenol ethoxylate free, contains naturally derived ingredients. 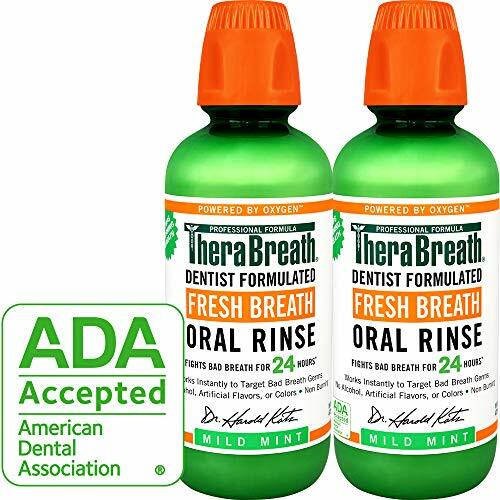 THERABREATH'S ADA APPROVED FLAGSHIP ORAL RINSE: Fresh Breath Oral Rinse is the premier TheraBreath product introduced by Dr. Katz over 20 years ago. It's been clinically tested and is one of America's best-selling specialty oral hygiene treatments. STOPS BAD BREATH - GUARANTEED: This oral rinse neutralizes sulfur-producing bacteria and destroys morning breath and food odor. Clinical studies have demonstrated that this product is effective at attacking bad breath odor for up to 24 hours. NO STINGING OR BURNING SENSATION: Dr. Katz's oral rinse contains no alcohols or artificial flavors, and is certified vegan, kosher, and gluten-free. It is also pH-balanced to maintain a non-acidic oral environment and avoid tooth sensitivity and enamel erosion. DENTIST RECOMMENDED: Available without a prescription, this dentist recommended oral rinse is formulated with an oxygenating agent that is recognized as safe and effective. Our formula instantly goes to work by directly attacking germs and odors. WORLD'S #1 CLINICAL OXYGENATING MOUTHWASH: TheraBreath Fresh Breath Oral Rinse has been recommended by pharmacists and dentists for more than 20 years to people concerned about keeping their breath fresh. If you have any questions about this product by TheraBreath, contact us by completing and submitting the form below. If you are looking for a specif part number, please include it with your message.